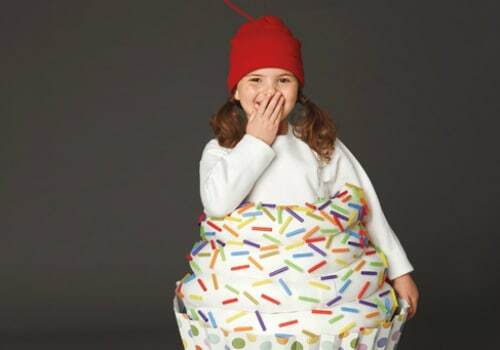 DIY Halloween costumes can come in at a fraction of the cost of store-bought costumes. They are also often more creative and fun as well. In this list of the best homemade Halloween outfits, we have collected a variety of creative and easy to make costumes. Many of these costumes are also made with supplies you already have around the house as well. So if you are in a time crunch, you can still create a fun costume. 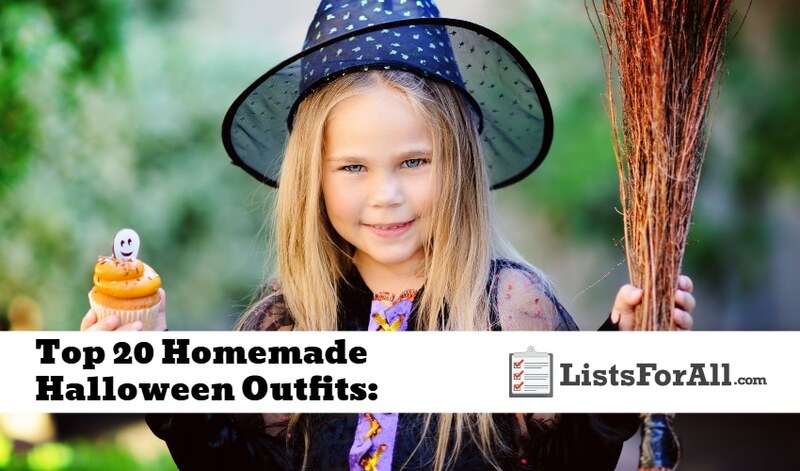 And, not to worry, even if you are far from crafty, many of the costumes on this list require minimal DIY skills. 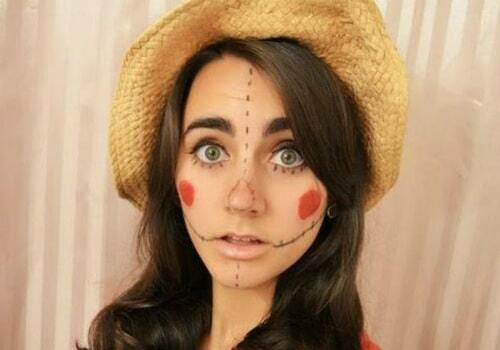 So, take a look, get inspired, and start your homemade Halloween outfit today! 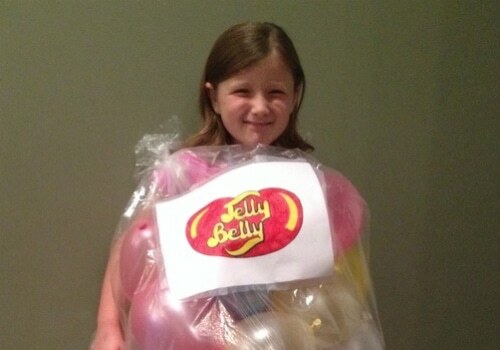 With just a clear trash bag and bag of balloons, you can transform into a giant bag of jellybeans. Once your balloons are blown up, have someone help you package the ‘jelly beans’ into a trash bag that you have put on. To put the trash bag on, simply cut slots for your legs in the bottom of the sack and then pull it up. Once you have all of the balloons in, cinch the bag loosely around your neck. This costume is just that easy to make. And, for even more authenticity, print out a Jelly Belly logo and affix to the front of your bag. While this costume works best with a white or clear umbrella, a colored umbrella can also work in a pinch. To become a jellyfish, open your umbrella and attach long, streaming ‘tentacles’ (streamers work well, as do fabric strips). 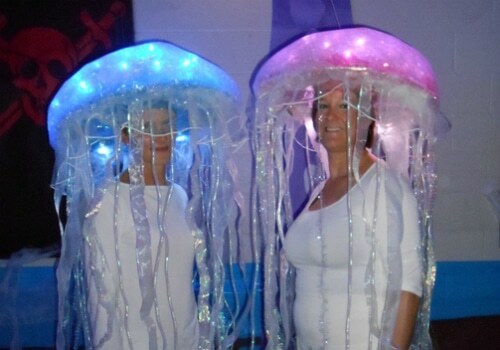 After that, you are going to dress up to match your umbrella jellyfish covering. From here it is easy holding your umbrella and ‘floating’ through the crowd. Did you get straight A’s in school? Well, whether you did, or want to pretend as if you did, this is the costume for you. 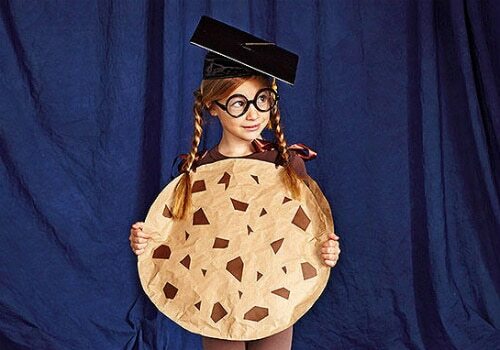 A cookie with a graduation hat is a pun at it’s finest, or maybe it’s worst, either way though, it will be a good laugh when people recognize it. Also, if you have an old graduation cap, you are already halfway done with this costume. 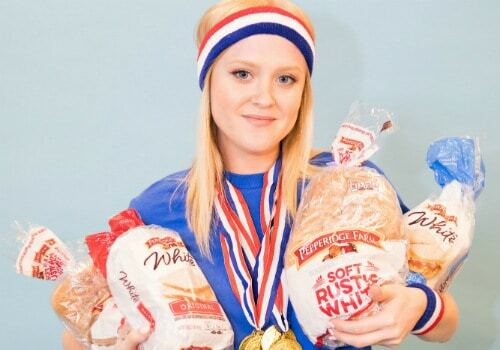 Another great pun costume, this breadwinner costume is super easy to put together. And, while it might have friends rolling their eyes as they figure it out, it is still a great costume. So grab an old trophy or medal and a loaf of bread, and you are ready to go as the breadwinner. This costume is great for kids, but could also be for adults as well. It requires a little bit of prep time, but the end result will be well worth it. 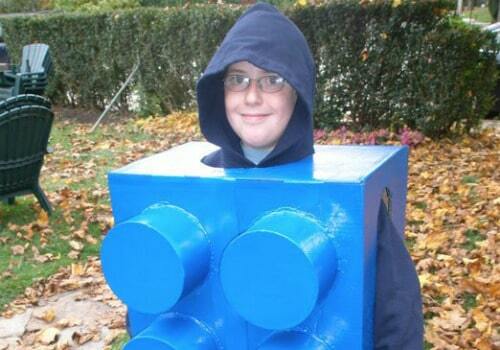 Using an old cardboard box, empty tins, glue, and spray paint you can make this Lego costume. If you have multiple boys, consider making several different colored lego costumes for them. Whether you have seen E. L. James’ Fifty Shades of Grey or not, you can still make this costume. 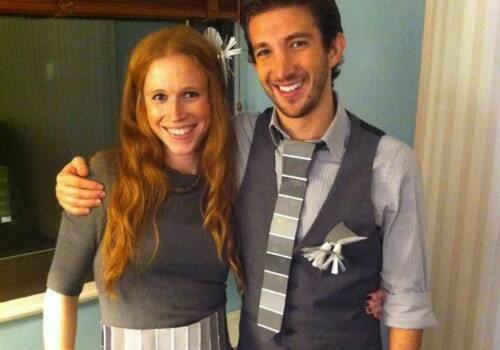 Perfect for both couples or on its own, this costume is easy to make and looks great. All you need is some grey clothing and a bunch of differently colored grey paint tabs. Don’t worry; you don’t have to have exactly 50. And for the best part, these paint sample tabs are all free. Just stop by Home Depot, Lowes, or Walmart and grab an assortment of them. Do you have a bright yellow shirt or dress? 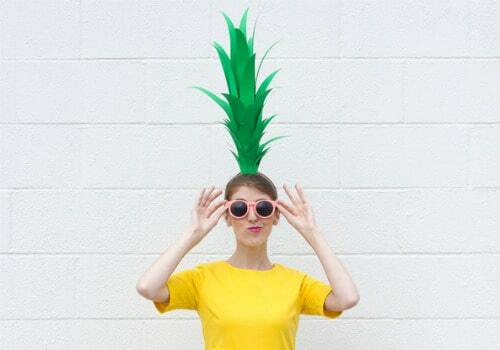 If so, your pineapple costume is already almost completed. From here, just cut up some green poster board in the shape of leaves and glue them to an empty toilet roll. A headband will hold the top in place, and a pair of sunglasses will be the final touch for this tropical fruit costume. Whether you grew up in the 90s or not, you are most likely familiar with the band Nickleback. 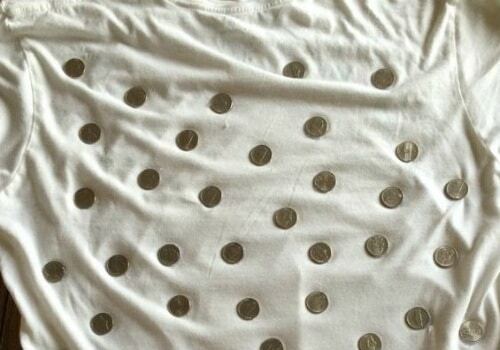 Well for a super pun costume, and one that is very easy to make, glue some nickles to the back of a white t-shirt. For the price of an old t-shirt and 50 cents in nickels, you can become Nickleback. Scarecrows are an essential part of fall and Halloween, so why not be one for your costume? And, with a variety of different types of scarecrows, you can go for scary, fun, or anything between. This costume doesn’t require much DIY either. A pair of overalls, a flannel shirt, and some face paint, and you are ready to go. So whether you are looking to go all out, or do the bare essentials, this is a great DIY costume option. There is just something about pun costumes that people love. It is probably the recognition that you see on someone’s face as they finally realize what your costume is. This blessing in disguise costume will definitely allow you to see that expressions on people’s faces as they process what you are. 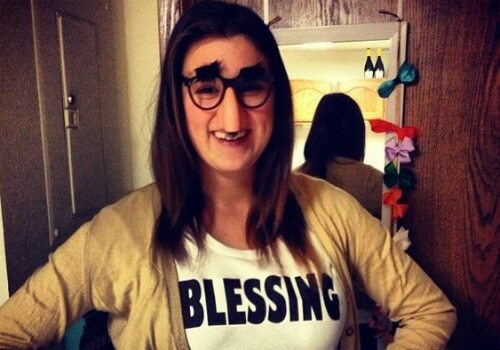 So grab a cheap face disguise from your local party store, make a ‘blessing” shirt, and become the blessing in disguise that all of your family and friends need. 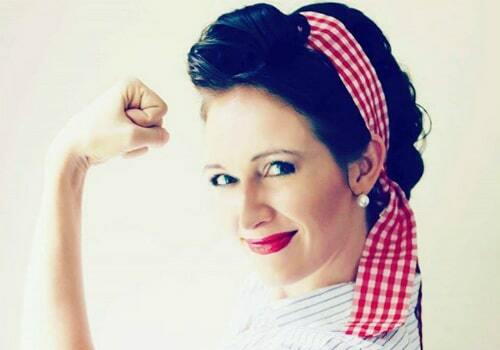 Rosie the Riveter helped win World War 2, and she is going to help you win this Halloween as well. With a red bandana and a denim shirt, you can become this American hero in no time flat. And, for even more character buy-in, make sure to have some temporary tattoos drawn on your arms and bright red lipstick. A few arm curls will also help to improve your flexing throughout the night as well. Peace, love, and happiness. 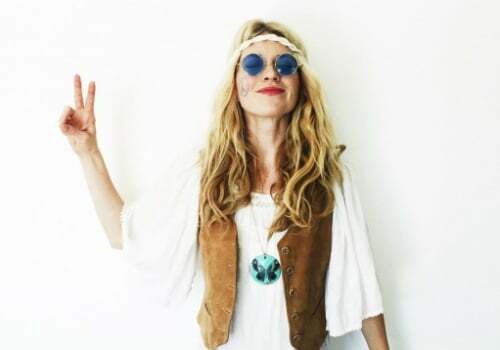 Whether you were alive during the ’70s or not, you can still pretend to be a hippie. And, with a variety of options as to what a hippie looks like, there is a good chance that your local Salvation Army will have everything that you need. So get your flower power on with this homemade Halloween outfit. 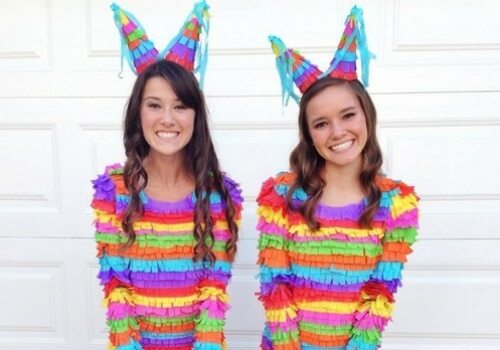 For a fun and festive costume why not be a piñata? To transform into a human piñata buy 3-5 different colors of streamers and cut them into 4-5 inch strips. Now hot glue the cut up strips onto a dress or shirt and shorts in whatever color pattern you would like. For even more fun, use your leftover streamers to make a donkey tail and ears. 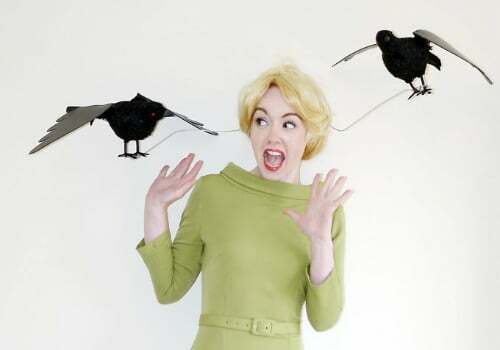 To create this Tippi Hendren from The Birds look you will have to purchase some fake birds. Party stores usually have them though, especially around Halloween, and they are relatively inexpensive. Once you have 2-4 birds (or more if you are feeling especially in the Halloween mood!) affix the birds with hot glue to clothes you don’t mind ruining (Good Will, anyone?). Add in a few rips and tears, and perhaps some fake blood, and you will have everyone jumping at the sight of a bird. For those who aren’t DIY inclined, this costume is perfect. To transform into Waldo or Wilma from Where’s Waldo?, simply wear a red and white horizontally striped shirt, a white beanie with a red band (a piece of red felt can easily be attached to a white beanie with hot glue), and a pair of black rimmed glasses (perfect for those who already wear glasses!). For added authenticity have a camera hanging from your neck. Great for kids and adults alike, this homemade scuba diver costume is perfect. You can find the majority of the pieces to this costume in your kitchen as well. Metallic scouring pads, rubber tubing, and a 2-liter plastic soda bottle make up the scuba gear. And, for the rest of the costume, all you need is black clothes for the ‘wetsuit’ and either swimming or safety goggles. 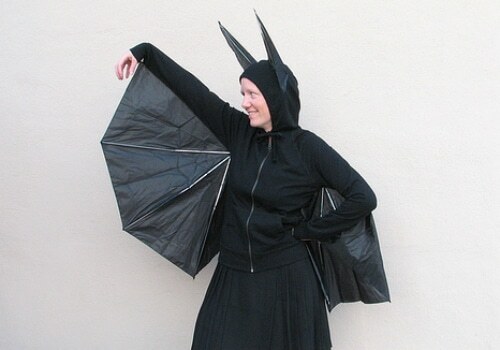 With a black hooded and zippered sweatshirt and a cheap black umbrella, you can become the perfect Halloween bat. And thankfully, with the detailed instructions provided, taking apart the umbrella to form the wings and ears is a breeze. Have a set of light green sheets? Then you have pretty much all of the supplies needed to transform into Lady Liberty. Once you have draped your sheet into Lady Liberty inspired clothing, cut out a green foam visor (found at almost any party store or craft store) to wear. 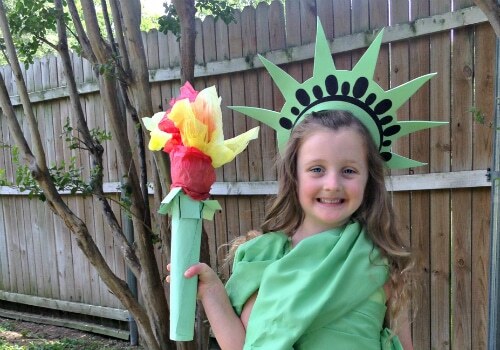 This simple DIY costume will have you looking like Lady Liberty from head to toe. For added authenticity add a ‘torch’ to the outfit (a tissue paper covered flashlight works well). If you have been described as ‘bohemian’ you probably already have all the pieces needed to transform into Frida Kahlo. 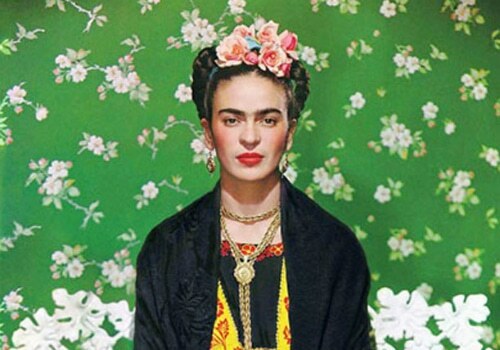 Simply pair a long flowing skirt with a loose shirt, add plenty of bangles, and few silk (or real) flowers in your hair and then darken your brows for a classic Kahlo look. There is just something about being able to put on a Halloween costume that you made yourself. Not only will you have saved money, but you will be able to say that you made it with your own hands. With all of the homemade Halloween costumes on this list, there has to be something that jumped out at you. So what are you waiting for? Get to putting together your masterpiece. Just be ready to answer a lot of questions like, “how did you make that?” throughout the night. We would love to hear how your costume turns out in the comments below as well!